The legend of Jean-Gabriel Pageau is growing in Ottawa! Yes I said Jean-Gabriel Pageau! No, not Erik Karlsson, Daniel Alfredsson, or even Craig Anderson but rather the man I will call JGP quite often from here on out because it’s much easier. Now it’s certainly a bit early to say legend, but when you score your first career hat-trick in the National Hockey League during the playoffs, for your home town team, on home-ice and against a bitter rival, people tend to get especially excited. With all due respect to every Senator who played well and contributed Sunday night, most people will agree that game and night belonged to JGP. Now some will not and others may still be wondering exactly who the heck is this Pageau guy anyway? Well the short answer is he is yet another unexpected and emerging story for the Ottawa Senators, another “young gun” coming up big and he has picked the perfect time to announce himself. At 5’9” and 163 lbs. 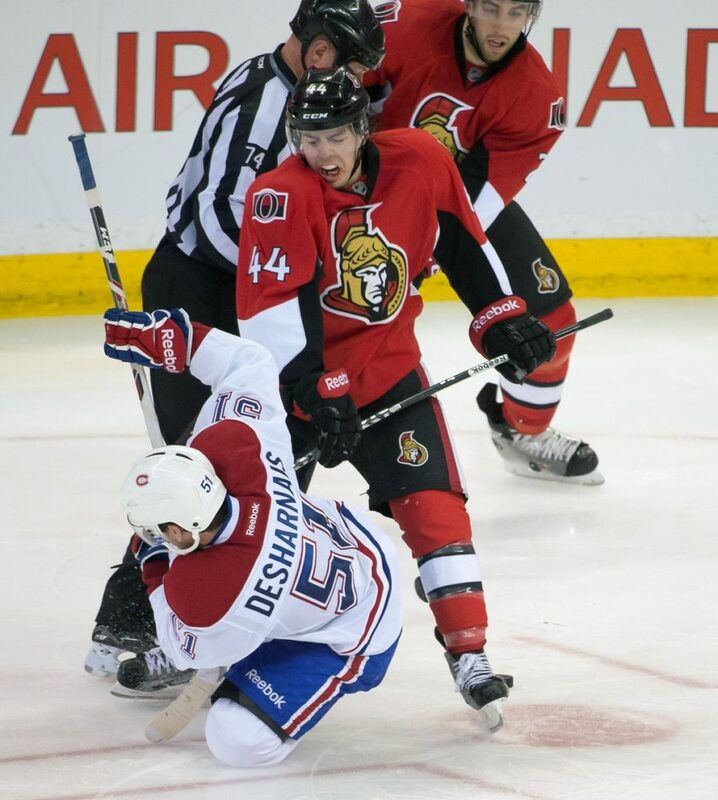 Jean-Gabriel Pageau, sorry JGP, is hardly a big man. However on Sunday night in Ottawa, three goals, four penalty minutes and one missing tooth later, he was the biggest thing going in the Nation’s Captial. So much so that the chants of Pageau, Pageau, Pageau began to ring out from the Sens fans, fittingly in the rhythm of the famous Montreal Canadiens Ole, Ole, Ole by mid second period. It was certainly a special moment for the young Ottawa native. JGP spent most of the 2012-2013 campaign in the American Hockey League with the Binghamton Senators, his first full season of pro hockey, where he posted a very modest 7 goals and 22 assists for 29 points in 69 games played. The first year pro had watched many of his Binghamton teammates get the call-up to the big club throughout the season as the Ottawa Senators were hit hard by injuries. He no doubt hoped that one day he may get that call and the chance to wear an NHL sweater but also realized that these call-ups had now given him a bigger role and much more opportunity for ice-time and experience. Pageau made the most of those opportunities, improved his game and when Ottawa needed to add another player late in the season, they looked to Jean-Gabriel Pageau. JGP was called up by the Ottawa Senators April 10th and earned an assist in his first career NHL game against the Philadelphia Flyers on April 11th. He impressed and ended up playing in the final 9 games of the regular season for Ottawa, contributing two goals and two assists. Both goals were game winners for Pageau, including the one in the final game of the season against the Boston Bruins, in which his two point effort helped the Sens move up to the seventh spot and secure a more favorable first round playoff match-up. He averaged well over ten minutes of ice-time per game and was a plus player during that time as well. JPG’s strong work ethic and raw talent was not lost on Head Coach Paul MacLean and the rest of the Sens coaching staff and it earned him a spot on the team’s playoff roster for the series against the Montreal Canadiens. After a relatively quiet first two playoff games, certainly fair for a rookie pro making his NHL postseason debut, Pageau made more than a splash in Game 3. After a tight first period, the JPG show began as he broke a 1-1 tie less than five minutes into the second period. Pageau took a great pass, went in on a breakaway and scored his first of the night with a beautiful shot, giving Ottawa the lead they would not relinquish. That being said it remained a close game after two periods with the Sens only up 2-1. Enter Pageau yet again as he provided the critical third goal for the Sens, his second of the game, before the third period was two minutes old and at that point the blow out was on. Then with the Sens firmly in control of the game, up 5-1 late in the third period, Pageau officially vaulted himself into Ottawa Senators playoff history by recording his third goal of the game. It was the ideal way for both he and the team to cap a terrific performance from start to finish. Now Pageau, while the feature story, was only one story in a wild night at Scotia Bank Place on Sunday. The game itself went from a typical close playoff contest, similar to that of Games 1 and 2 in this series, to a full on rout by the Senators early in the third period and the emotions of both the game and the series to that point finally boiled over. Tensions between the two teams have been high since the Eric Gryba hit but after the Sens began to run away with Game 3, taking a 4-1 lead at the seven minute mark of the third period, the fuse was lit. A line-brawl erupted off the ensuing face-off and that was only the start of a fight filled penalty fest, with a few more goals sprinkled in, for the officials to sort out down the stretch. When all was said and done, the two teams had accounted for 236 penalty minutes, countless fighting majors and nine game misconducts, the Senators had taken a 2-1 series lead and everyone was ready for the next game to be played. Having said all that the biggest story of this game remained the incredible performance of young Jean-Gabriel Pageau and both Sens players and fans showed that by chanting his name in the stands and in the locker room as well as taking their stories and compliments to social media. “It was a great night for the kid. He’s come in and played very, very well for us,” Sens Head Coach Paul MacLean said. We’re really pleased for him, he’s been a good player,” he continued. As I said previously, it is way too early to put Pageau’s name up there in Sens playoff lore after one big performance, but we all know that names are made in the playoffs and Jean-Gabriel Pageau has everyone in the Nation’s Capital chanting and many others around the hockey world knowing his.